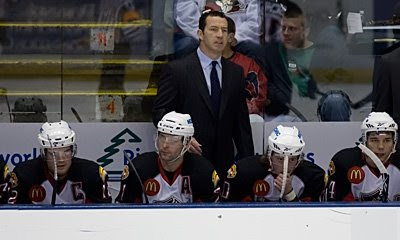 It took a little longer than it should have, but the Portland Pirates found a way to hold on and beat the Lowell Devils 3-2.The win tonight finally gave coach Kevin Dineen the franchise lead in victories, as he passed Barry Trotz with win 190. "I'm extremely honored (and) very grateful,” said Dineen. “(I) could not think of a better place..(to get) this victory." The entire 1st period was a feeling out process, both teams playing stingy defense and not allowing second chance shots around the 2 goaltenders. The Pirates Jhonas Enroth and the Devils Jeff Frazee were quite a pair to watch in the 1st Period. Enroth made a nice stick save early, while facing 11 shots in the period. Frazee made a nice shoulder stop on a blue line blast from Derek Whitmore late in the period, all while facing 10 shot. The Pirates finally got things going two minutes and four seconds into the 2nd Period as the AHL Rookie of the Week Tim Kennedy, off a nice play by Tyler Bouck, put one past Frazee for the 1 - 0 lead. The Pirates continued aggressive play for a couple of shifts, but then seemed to sit back a bit, letting the Devils control the offensive zone most of 2nd period. The Devils seemed to outwork the Pirates in the corners, getting to loose pucks and clearing the zone well before the Pirates could muster a scoring chance. Portland had many chances, even with the lack of control of their offensive zone, most noticeably a break away opportunity that Paul Baier had coming out of the penalty box. Baier was all alone, went to the forehand, and Frazee closed the 4 hole. The Pirates wrestled back control of the game at the 15:15 of the 2nd period as Marek Zagrapan deflected home a Mark Mancari wrister from the circle. Mancari made a nice deek play to the middle, dragged the puck past the defender and used a wrist shot to get it to the net. The goal was Zagrapan's 19th of the season. Not wasting any time, the Pirates got right back on the board as Marc-Andre Gragnani got his 8th goal of the season, getting out alone in the right circle, and posting a beautiful top-shelfer to put the Pirates up 3 - 0. The Pirates outshot the Devils in the 2nd 14 - 9. The Pirates seemed determined to not allow recent history to repeat itself and blowing yet another lead. Barring spectacular goaltending by Jeff Frazee, the Pirates would not have had to sweat this one out as much as they did. Lowell finally got on the board as Brian Gionta's little brother Stephen got his 1st of the year at the 6:42 mark. Portland then clamped down on D, the rest of the way, only allowing a late 6 - 4 Power Play goal with :30 left to Niclas Bergfors. The goal was Bergfors 20th of the season. Enroth finished the game with 39 saves on 41 shots and Frazee finished with 32 saves on 35 shots. The Pirates take on arch rival Manchester Monarchs Saturday night, as Manchester holds a 1 point lead for 3rd place in the division. The Pirates will turn back the clock, wearing the Boston Bruins colored Maine Mariners uniforms for the game. The Portland Pirates inducted the late Tom Ebright into the Portland Pirates Hall of Fame, in a moving ceremony between the 1st and 2nd periods. Speakers included Ebright's Widow Joyce Ebright and AHL President David Andrews. Asst Coach Eric Weinrich had to be helped off the bench in the 3rd period, as he took a puck off the head. While all looked OK, there was no word on his status at the end of game.